Recently I felt stuck in a rut. Not inspired, not excited about anything. 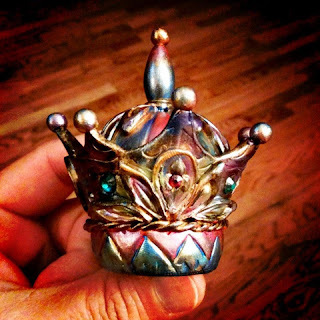 Then I tried out a new CraftArtEdu.com tutorial, "Enchanting Crowns," from my friend, Tejae Floyde. Talk about a lot of fun! What excited me was that I would be able to pull out my stash of paints and go to town. I enjoy mixed media pieces and I liked being able to add crystals and layer on all these metallic paints. Tejae discusses how the options and variations are endless. In fact, I have lots of ideas brewing now! Tutorials are a fun diversion when you don't feel inspired. Whether it's a technique or a project, you're bound to learn something new. Here's to more creative exploration and possibilities! This looks like it would be fun to do; I recently have been feeling uninspired, too. Maybe I should take a look a few different tutorials, so I can get my creative juices flowing again. Yes, Carmela, do it! Find a tutorial to try and let me know your results! Jainnie, Your crown is gorgeous! I love the rich looks to the colors and the jewel. How wonderful that you were able to view Tejae's helpful tute to get your creative juices flowing again.